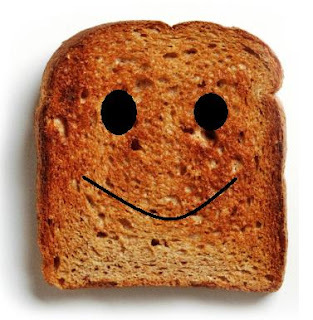 BreakMentalDown: Introducing the toast of the town... toast! You see that button right there? Press it. But don't press it again, just wait, it will all work out. With a little patience, we're seconds away from entering flavor country—better get your passport out. Don't rush it, please do wait. With my excellent advice, soon the toast shall rise. Soon you'll be happy. I go through this ritual every time I bring heat to bread. The reason it brings such happiness should be obvious—toast is delicious. Many people don't realize the insane bump in flavor of toast compared to bread. They're kind of like entry-level toasters. They'll create toast just to have something to go with their bacon and eggs, but they'll do little else. To them, a toaster is merely a way to get Eggos from the freezer into the belly in a somewhat less animalistic fashion. me feel bad for consuming it. Almost. Here's where I become brutally honest. I actually lived as one of those people for an entire year. No wait, I did far worse than just not using a toaster, I didn't even have one. No, it wasn't blasphemy 9or the far worse uber-blasphemy), at the time, I just didn't realize the foolishness of my actions. I might have been tucked away in a studio apartment with a thimble kitchen that could only fit an oven, stove, microwave and roughly 19 gallons of vodka, but I should have known better. I might have been able to make the drunkest of baked Pasta-Roni, but little developed in the toast department. Only when I moved in with a roommate did I acquire a toaster (his). Suddenly a whole new world opened up. Bread became toast. Pop-tarts transformed to haute (hot) cuisine. String cheese became something that could destroy an appliance, no matter how good the concept of toasted cheese sounded. That experience enmeshed me into the world of toasting and I absolutely fell in love with them. The best part about them, they cost like $9. With the amount of toasting I do, I'd pay somewhere in the tens of millions of dollars range. But I didn't, my roommate paid $9. An investment in a toaster is not just an investment in taste, it's a lifesaving endeavor. Did you know that nobody who has recently eaten toast has died from any major diseases? Seriously, check with the CDC, no cancer, no AIDS, no Nacho Related Sad Face Disorder (although NRSFD is somehow tied to nacho consumption). I've never taken a “Theory of Toaster” class, but I have ascertained the philosophy behind toasting. Bread goes in, delicious comes out. Not only is it delicious, but it's warm, which when butter is applied, makes it even more gooey and delicious. But this isn't news to anyone. From eating cake, everyone has realized the gooey-delicious connection. It's frowned upon to eat cake every day, but toast is perfectly acceptable, perfectly deliciously acceptable. Rio and I have certainly talked up toast quite a bit, but I realize it's not world's most perfect food. There's one problem inherent to all things toast. Crumbs. There's no way to eat toast without spattering them everywhere, even into places where you never thought you'd have em (your duodenum). While you're not supposed to stick a knife into a toaster, but I did it myself last week, and there's nothing like a good electrocution to add to the toasty flavor. Plus jam and butter. Electrocution, jam and butter, and you have one of the most perfect combinations in the world.